Qhub is a simple way to create a Q&A website. While other Q&A websites are great for information sharing and communities, Qhub offers a more targeted community managed by the people that are interested in that particular subject area. Each group is set up and started by an owner. Friends, colleagues, club members and more are invited to join and the questions can begin. Qhub offers the ability to customize each site. There is full management of your site, its members and content. It also offers the ability to use your own domain name. If someone asking you a question and you have the answer, why not open up that knowledge to the web community for their and your benefit? Alas, wish they’d open source this. I’d love a white label or open source q & a script. I agree with Austin. Just like a wordpress.org version for the hosted wordpress.com service. Or laconica/identica. I agree with Austin – I’d love to white label this application. Nonetheless I went ahead and set up a community. As the sign-in suggests it only took a minute. I also got my preferred username / site name – that being “wellness”. I’ll refrain from putting a link of any sort. Great post and a good find! @Poi Meyers Shapado looks like an interesting piece of software very similar to stackexchange. 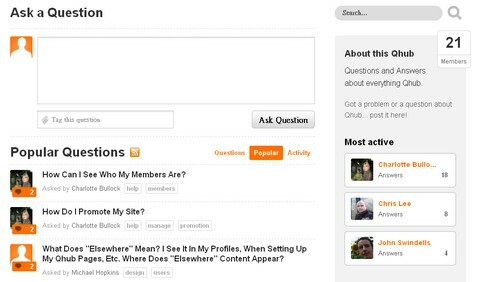 Regarding Qhub Im not sure which features your referring to but I Qhubs main “killer” feature is that it enables anyone without any technical knowledge to build their own Q&A community. Powerful easy to use moderation control. this is for users or private…? @Raghib The creator of a Qhub can choose, it can be completely private or an open community. but it just seems that qhub uses the kiss method and people dont find it as intimidating as some of the other solutions here in the comments.